The Wanamaker is not only the world’s largest organ, it is also the largest musical instrument on earth. Moreau Claude, an organist from Paris, appreciates such things. After all, he has a beautiful organ in his own home and has studied under Marcel Dupre. For his 70th birthday, his daughter bought him a ticket to go see this grand organ and fulfill his lifelong dream. It was a round-trip ticket however since this instrument’s home is not in Europe but inside the Lord and Taylor department store in downtown Philadelphia and can be seen only in America. After hearing the organ play on Monday and Tuesday, a happy Mr. Claude and his daughter got back on the plane Wednesday for the long trip home. According to the official organist, Peter Conte, such trips are not uncommon. “There are other people in Europe,” he said, “that save up for years to come over and see it.” Such trips he referred to as veritable pilgrimages. It seemed odd to me that such a thing would exist in a department store. That is the reason I had to see it for myself. As I walked through the doors and past the men’s clothing area I arrived in the Grand Court which is 112 feet long and 66 feet wide. Expecting to merely hear an instrument of great quality, my first thought upon seeing this organ was how stunningly beautiful it was. Its golden hue and multilayer structuring emits a defined sense of hierarchy synonymous with queenly dignity. I felt I was truly being received in audience by something a brochure I picked up aptly defined as “The Reigning Monarch of Instruments.” Her throne is appropriately located high above the gallery on the south end of the court; a gallery which seats 100 musicians on special occasions. The history of this organ is as rich as her regal surroundings. The present console was built in the late 1920’s and installed between 1930 and 1932. It controls the Grand Court Organ and, with a total weight of 5800 pounds, contains approximately 100,000 parts. It has 729 tilting tablets, 168 pistons and 55 auxiliary controls. It stands on a pivot and truck to facilitate rotation. One thing Mr. Wanamaker lacked, however, was an organ for the entertainment of his customers. He believed music was just as important to a well rounded life as work and exercise. He thus began a trend which was common in the early 1900’s for department stores to provide soothing organ music for their shoppers. 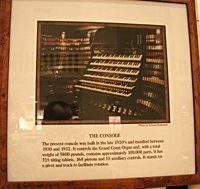 And so it was that John Wanamaker’s son Rodman bought the famous Louisiana Purchase Organ now known simply as the Wanamaker. It had been displayed at the 1904 St. Louis World’s Fair and was sitting in a warehouse after plans for installing it in the Kansas City Municipal Auditorium fell through. Those unfamiliar with organs will appreciate its grandeur by comparing it with other organs. The world renowned Cavaillé-Col organ in Notre Dame Cathedral has 7800 pipes. The Sydney Opera House grand organ boasts of 10,000. The Wanamaker has no fewer than 28, 482. And the variety is equally staggering. Some pipes are as small as a child’s pinky while the largest one, being 32 feet long, would allow the same child to play hide and seek inside. Curt Mangel, curator and restorer of the Wanamaker. Back in the twenties, there were 40 full-time employees looking after her. Today there are only two. One of them is Curt Mangel. He is the curator. However, this title in no way describes all he has done for an instrument described as “unplayable” in 1991 by Peter Conte. He has literally brought it back to life and describes what he does as a “labor of love.” Now it is operating at 96 percent of its capacity. He was interested in organs since he was a young boy and laments the fact he first visited the Grand Court only eight years ago. Amazed with the organ’s beauty, he also noticed it needed a lot of work. Realizing the importance of this instrument, he organized a group of professional volunteers to come in for one solid week to work on it. He ended up staying as a volunteer for five years. Lord and Taylor eventually hired him as a consultant. I was able to go behind the scenes where the menagerie of pipes is located and saw first hand the almost countless screws and bolts that were replaced to make it what it is today. I was in awe at the laborious precision of the restoration accomplished under the direction of this one man. He is someone you cannot help but like although he is a man of few words. When speaking about his work on this organ, he looks to the horizon as if to distance himself from the value of his labors, not wanting credit for the good he does. Peter Conte, official organist of the Monarch of Instruments. 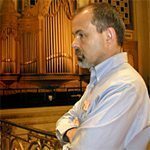 Wallace J. Mclean is a proud volunteer with an organization called The Friends of the Wanamaker Organ. He is a 78 year-old man with the eyes of a 14 year-old. That was his age when he first heard the Wanamaker played. “I never forgot it,” he said. He derives an obvious joy being there and described his reason for becoming a volunteer very succinctly. “I have been taking from the organ all my life” he said. “It’s payback time now.” He speaks with passion about the organ as tears well up in his eyes. Before leaving, I saw a couple who seemed noticeably more moved than the rest. They were Mr. and Mrs. Robert Hoppe from Waverly, New York. They both looked well considering they had just finished a six-hour train ride. Like the Frenchman, he too was celebrating a birthday with a trip to see the Wanamaker, compliments of his wife. 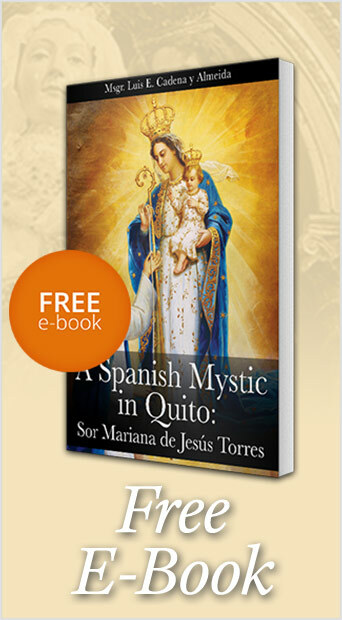 “I could not have given him a better gift,” said Mrs. Hoppe. “He was so happy when I told him we were coming, he was grinning from ear to ear.” With camera in hand, she was snapping photos of the majestic organ pipes high above her while her husband stood in silent admiration. This comment said it all. Organs may come and go but there is nothing like the Wanamaker on planet earth. More impressive than its size and the appreciation of those who come from far and wide to hear it is the resolution of those determined to preserve her. Many people would not expect to see Americans make the Herculean effort of these men to save such a relic of the past. Nor would they think it possible for a high-end store like Lord and Taylor to support this endeavor. I could almost hear them suggest piping computer-generated music behind the façade of this magnificent organ as an alternative to expensive repairs. Others might go a step further and suggest getting rid of the organ altogether. Sacrificing her to the “god of consumerism,” would, after all, free up a lot of space which could be used for more merchandise. However, that is not what Lord and Taylor chose to do. And with the help of a dedicated curator, an accomplished organist and a lot of dedicated “friends,” its sound is live and its appearance grand. It can be heard and appreciated — only in America. 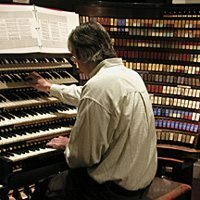 For more information on the Wanamaker Organ, please go to: www.wanamakerorgan.com. This entry was posted in Fighting the Culture War and tagged America, Cathedral, Cavaille-Col, Chorus, console, Curt Mangel, gallery, Grand Court, Hallelujah, Handel, Lord and Taylor, Macy's, Marcel Dupre, Monarch of Instruments, Notre Dame, Only in America, Opera Company of Philadelphia, organist, Paris, Peter Conte, Philadelphia, pipes, Reign, shopper, store, Sydney, TFP, Tradition, video, Wanamaker, Wanamaker Organ by Norman Fulkerson. Bookmark the permalink.